While working on a recent project I had to create an InfoPath 2010 form which took some parameters and queried CRM to retrieve additional details. At first I tried to setup a new Web Service data connection but I kept getting errors so instead decided to handle it all in code on the page load. Anyone who has developed an InfoPath form with code behind knows it can be a very frustrating process to write the code and debug issues. In addition the deployment process can take a while which results in the whole processes being very time consuming. To get around this I decided there was no reason why I couldn’t create a Windows Forms application and use it as a test harness for the code. I created a new Windows Forms Application, designed my UI, added my CRM references and implemented the code. After a few iterations of testing I was successfully able to pull information back from a development CRM instance. 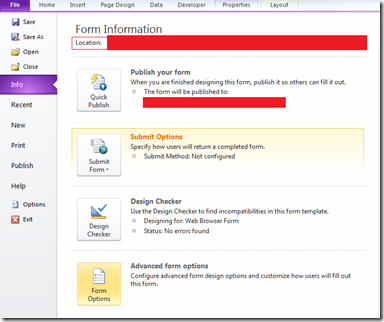 I then moved my code into the InfoPath form, made the required changes and deployed it. As with all development I was hopeful this would work first time around but it didn’t . I looked at the ULS logs on the SharePoint server and noticed the error below. System.Security.SecurityException: Request for the permission of type ‘System.Net.WebPermission, System, Version=2.0.0.0, Culture=neutral, PublicKeyToken=b77a5c561934e089’ failed. 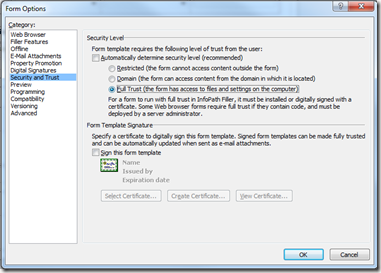 Only set forms you have developed to Full Trust as doing this can leave you open to potential security issues. You are currently browsing the archives for the InfoPath 2010 category.